Big Real Estate Firms Love Tax Havens. It’s Not Illegal, But Is It Immoral? The Paradise Papers data leak threw daylight on the use of tax havens by individuals ranging from Queen Elizabeth II to Bono. As a result there has been uproar around the globe to stamp down on tax avoidance through places like Jersey or the Cayman Islands. In commercial real estate, the use of such tax havens is completely normalized. It would seem the sector is out of step with a good portion of public opinion. What real estate companies do when they buy buildings through companies registered in tax havens is not illegal. But, is it immoral? Grand Cayman, one of the world's tax havens. The Paradise Papers cited commercial real estate firms like Blackstone and Colony NorthStar as having used tax havens to buy assets to avoid paying tax on them in the country these companies are based. There are arguments that utilizing tax havens even for legal purposes is immoral and helps facilitate criminality. “The Paradise Papers show exactly the same thing as the Panama Papers: tax havens allow lawyers, bankers and real estate agents to protect clients from paying tax on their assets, and that there is one rule for the rich and another rule for everyone else,” said Naomi Hirst, senior campaigner at anti-corruption campaign group Global Witness. Economist Gabriel Zucman estimates about 8% of the world’s assets are held in tax havens, drastically reducing global tax take from governments — to the tune of €47B in the U.S. and €12.7B in the U.K. — which benefits a small global elite rather than the vast majority of citizens. To apply this analogy to real estate, why should an investor be allowed to reap the benefits of owning an asset in a certain country, such as the economic growth of a country or city, or the creation of infrastructure around an asset, without giving something back in the form of paying the full amount of tax in that country? The extent of use of tax havens in a country like the U.K. is hard to gauge, but data from Case Business School professor of real estate economics Tony Key gives a hint. In 2011 he estimated there was £385B of investable commercial real estate in the U.K. and that 25% was owned by overseas investors, a fair slug of which is likely to be owned through offshore companies. The Paradise Papers showed how funds managed by Blackstone had bought the Chiswick Park business park and St. Enoch shopping centre in the U.K. through Jersey and Luxembourg-based companies to reduce taxes paid. It showed a fund managed by Colony NorthStar had used Cayman Island companies to buy assets. 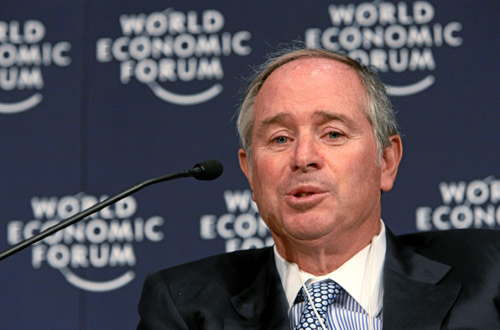 The coverage of the leak focused on Blackstone and Colony because the chief executives of the two firms, Stephen Schwarzman and Tom Barrack, are advisors to U.S. President Donald Trump — the Paradise Papers sought to show how figures close to Trump frequently utilized tax havens. Colony Capital founder and Executive Chairman Thomas Barrack Jr. has reassumed his role as CEO of the global real estate investment management firm. The responses of Blackstone and Colony highlighted how much of a normal practice this is in commercial real estate. “Colony NorthStar is in strict compliance with the letter and spirit of all applicable rules for cross-border business, as we have been for more than 25 years,” Colony said. “Blackstone’s investments are wholly compliant with U.K. and international tax laws and regulations,” its response said, and highlighted how commonplace the practice is. There is also an argument that without tax havens, cross-border business, including real estate investment, would be much harder and thus the world’s economy would grow more slowly. “Fundamentally, offshore centres facilitate the cross-border economy by helping individuals and organisations do deals across borders,” said Mark Pragnell, head of commissioned projects at consultancy Capital Economics. They are used to ensure companies investing across borders do not pay tax twice on the same deal. "There are variations of black, white and grey," real estate tax consultant John Forbes said. "Lumping everything together — whether it is tax evasion, aggressive avoidance or just plain reducing the amount of tax you pay — risks distracting attention from people undertaking genuine money laundering, which is a problem with U.K. property. There is a big difference between corporates reducing tax and dictators laundering stolen wealth." Like all areas of business, real estate tends to be amoral even if it is not expressly immoral. Even though this practice is facing criticism now, it is unlikely to change any time soon.